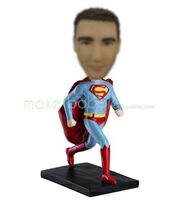 Personalized custom superman bobble heads - a love more than a gift! The well-balanced person never takes life too seriously all the time and always makes time for humour and a sense of fun. Even in the seriousness of the workplace, stress and tension can always be relieved by a little humor. Use a fun Bobblehead to stimulate stress relief and show that even you can sometimes let your hair down.